In 2007 Prince did 21 more or less sold-out shows at the huge O2 arena in London during a period of 31 days. Everyone who was there or has ever seen a Prince live concert will know that not many other musicians is on par with Prince when it comes to live music and live performing. But of course he didn't just play the 21 stadium shows. He also did a lot of aftershows in the more intimate IndigO2 venue right next door. Prince aftershows are loose gigs packed with jams and often with rare or alternate versions of Prince songs or cover versions of some of Prince's musical heros. The new photo book 21 Nights comes with a cd filled with just that. 15 songs and jams from aftershows performed at the IndigO2. It is an absolutely great cd. You get funky stuff, great horns, superfunky bass, stunning guitar and some funny talking from Prince as well. 3121 is so much better live than it is on cd and this version is jamming right into D.M.S.R. Girls And Boys is a crowd favourite and it moves right into Song of the Heart in a really cool way with Bass and horns playing a major role. In fact it moves further as Delirious is also in the loop. Beggin' Woman Blues is a previously unreleased song with quite funny lyrics. Beverley Knight performed with Prince at several of the shows at the IndigO2 and Rock Steady clearly shows that she is a great and powerful singer. Whole Lotta Love has Prince's guitar in full effect and he is simply stunning when he plays that thing. He should do it a lot more in my opinion. It sounds even better when you are there but what we get here is well good enough to blow you away. Alphabet St. is obviously superfunky with a totally cool bass line. We get two songs with Shelby J. on leadvocal and I will make it short: I really don't like her voice. Give me two songs with Beverley Knight instead anytime. Bev sings a hell of a lot better. The One is mixed into Prince's fantastic guitar from The Question Of U and it simply sounds fantastic. All the Critics Love U In London ends a very great aftershow cd by Prince. 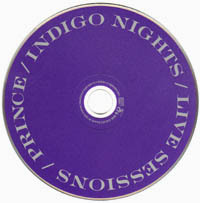 It is a hell of a lot better than the It Ain't Over aftershow cd from the Prince One Nite Alone... 2002 boxset. It could have been even better if he had altered the tracklist and added some more guitar tracks but it is still a very fine collection. This cd is worth the price of the photo book alone. And the photo book isn't expensive at all, so there's nothing to wait for. Read about the photo book here. Tracklist: 3121 (incl. D.M.S.R. ), Girls and Boys, Song of the Heart, Delirious, Just like U (monologue), Satisfied, Beggin' Woman Blues (new), Rock Steady (w/ Beverley Knight), Whole Lotta Love, Alphabet St., Indigo Nights, Misty Blue (w/ Shelby J), Baby Love (w/ Shelby J), The One (incl. The ? of U), All the Critics love U in London.